UXBRIDGE, Canada , May 18 2014 (IPS) - Conflicts with local communities over mining, oil and gas development are costing companies billions of dollars a year. One corporation alone reported a six billion dollar cost over a two-year period according to the first-ever peer-reviewed study on the cost of conflicts in the extractive sector. The Pascua Lama gold mining project in Chile has cost Canada’s Barrick Gold 5.4 billion dollars following 10 years of protests and irregularities. No gold has ever been mined and the project has been suspended on court order. And in Peru, the two billion dollar Conga copper mining project was suspended in 2011 after protests broke out over the projected destruction of four high mountain lakes. The U.S.-based Newmont Mining Co, which also operates the nearby Yanacocha mine, has now built four reservoirs which, according to its plan, are to be used instead of the lakes. “Communities are not powerless. Our study shows they can organise and mobilise, which results in substantial costs to companies,” said co-author Daniel Franks of Australia’s University of Queensland, who is also deputy director of the Centre for Social Responsibility in Mining. “Unfortunately conflicts can also result in bloodshed and loss of life,” Franks told Tierramérica. The study is based on 45 in-depth, confidential interviews with high-level officials in the extractive (energy and mining) industries with operations around the world. “Conflict translates environmental and social risk into business costs” was published May 12 in the Proceedings of the National Academy of Sciences (PNAS). A special report “Costs of Company-Community Conflict in the Extractive Sector” based on the study is also available. “We wanted to document the costs of bad relationships with communities. Companies aren’t fully aware and only some investors know the extent of the risk,” Franks said. “If companies are interested in securing their profits then they need to have high environmental and social standards and collaborate with communities,” Franks said in an interview. Investing in building relationships with communities is far less costly than conflict. Local people are not generally opposed to development. What they oppose is having little say or control over how development proceeds, he added. “We want development that benefits indigenous people and doesn’t just benefit someone’s brother-in-law,” said Alberto Pizango, president of the Interethnic Association for the Development of the Peruvian Rainforest (AIDESEP), an indigenous rights organisation in Peru representing 1,350 Amazon jungle communities. “Indigenous people have something to say about harmonious development with nature. We don’t want development that destroys our beloved Amazon,” Pizango told Tierrámerica from Lima. 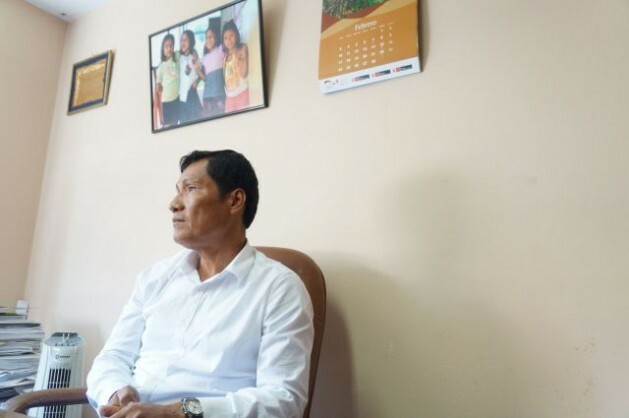 Pizango has been actively resisting the government of Peru’s selling of petroleum concessions to foreign companies on lands legally titled to indigenous people. The struggle turned violent outside the northern jungle town of Bagua on Jun. 5, 2009, when armed riot police moved to evict peaceful protesters blocking a road. In the clash 24 police officers and 10 civilians were killed. Pizango and 52 other indigenous leaders were charged with inciting violence and 18 other crimes. They went on trial May 14 in Bagua. The indigenous people were protesting 10 legislative decrees they considered unconstitutional, which were put in place by the government to foment private investment in native territories. “We had no choice and thought our protests were fair and that we were right. But it was too high a price. We don’t want to see that again. We want to move from the ‘big protest’ to the ‘big proposal,” said Pizango, who faces a life sentence if he is found guilty. The study published in PNAS shows that the violence in Bagua could have been avoided if companies and the government acknowledged indigenous rights and worked with local communities. “It is with great sadness I say this has yet to happen in Peru,” said Pizango, who was not even in Bagua when the violent clash occurred. Meanwhile, Peru’s Environment Ministry has asked Pizango and AIDESEP to assist in the planning of the big U.N. climate conference to be held in Lima at the end of the year. The indigenous leader hopes the event will show the world that native people can protect the forest and the climate. Repairing relationships between communities and companies and governments is difficult, said Rachel Davis, a Fellow at the Corporate Social Responsibility Initiative at Harvard University. “It is much harder for a company to repair its relationship with a local community after it has broken down; relationships cannot be ‘retro-fitted’,” said Davis, a co-author of the study. Franks compares this to a divorce, pointing out that only rarely do partners remarry. Leading mining corporations have apparently begun to understand this, and are implementing the U.N. Guiding Principles on Business and Human Rights and adopting the International Council on Mining and Metals Sustainable Development Framework, Davis said in a statement. But this is not the case in the oil and gas sector. “Their culture is very different. They’re not used to dealing with communities,” said Franks. The study shows that environmental and water issues are the biggest triggers of conflicts. Activities like hydraulic fracking for unconventional gas and oil are on the rise and are affecting water. Big conflicts are coming, he predicts. “It’s a good report but doesn’t address the broader economic and political pressure to push projects through quickly,” said Jamie Kneen of MiningWatch Canada. Shareholders want big returns on their investments and governments want their royalties sooner rather than later. All of this makes corporations less willing to compromise or to take the time to find alternatives that might be acceptable to local people,” Kneen told Tierrámerica. “Companies know there will be problems with local communities. Companies often gamble that any conflict will not get too high a profile and try to hide this risk from investors,” he added.